EVOLVE! Campaigns - What's wrong with dairy? Dairy is a dirty business. 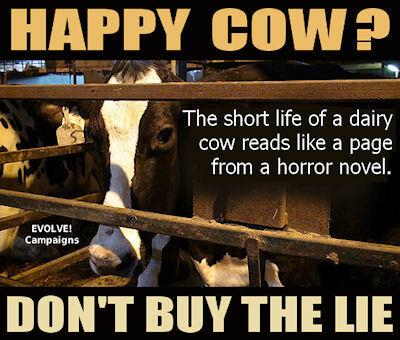 There is no such thing as a "laughing cow", dairy cows are not "happy", they do not live in sunny green meadows, nor do they stroll casually along beaches at sunset, nor work in factories cheerfully packing up butter "made by cows". These television adverts are grossly deceptive and depict scenes far from the ugly truth. Cows only produce milk because they've had a baby. 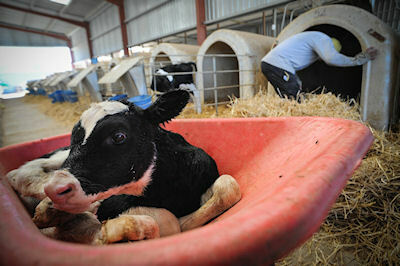 Their milk is supposed to be for their calves, but in the dairy industry calves are considered 'unwanted by-products'.. When you drink milk you condemn an innocent calf to death and its mother to a life of slavery. The abuse and suffering that we inflict upon dairy cows is nothing short of appalling. The only reason a cow produces milk is to feed her calf... yet within hours of her giving birth her baby is taken away, leaving both the mother and her youngster desperate with grief and confusion... and all so that we can take the milk for ourselves. And the babies? Terrified, orphaned and alone, they face confinement and death to make veal, or a short, brutal life of slavery like their mother. Dairy cows who in nature would live beyond 25 years are shipped to the slaughterhouse, tired out and totally spent, emotionally and physically, at the age of four or five. By living vegan you are rejecting this cruel practice and saying "Not in my name!" The dairy cow normally has her first calf at the age of two when she will be producing around 35 litres of milk a day. In subsequent lactations this figure rises even higher. She will continue to be milked for 10 months - but will be made pregnant again in the third month. The Truth Behind Dairy - An illustrated account of the truth behind dairy from the point-of-view of a calf on a dairy farm. By PeacefulAbolitionist on YouTube.